One of the advantages of starting a home business is being able to turn a passion or hobby into a profitable career. Some interests, such as reading, might seem hard to convert into a home business, but with some ingenuity and creativity, even bibliophiles can make money at home doing what they love. Here are 6 home business ideas for people who love books. Book blogs are very popular among readers and writers who need exposure for their books. The challenge is that it’s a crowded marketplace, so you’ll need to find a way to stand out from the crowd. This can be done in a variety of ways from choosing a specific niche (i.e. YA dystopian novels or cozy mysteries) or a market group (i.e. best books for pre-teens). Another option would be to deliver your book reviews and other information in a different way, such as through a podcast or videocast. Or you might combine options, such as a blog and weekly podcast. The key to success will be in generating avid readers to your book blog. To that end, you’ll need to develop a marketing plan, that includes social media and an email list. Getting paid for reading and reviewing books is a possibility, but it requires patience and diligence. The best way to start would be to have a blog on which you leave reviews (see above on starting a book blog). This not only gives you practice, but also, provides a portfolio of your reviews so media outlets that pay can see your work. Once you have experience, you can begin pitching yourself as a freelance reviewer to your local newspaper or magazine. You can also search for review jobs on freelance writing job sites. Kirkus is often looking for reviewers. It is said that 81 percent of people have a book in them, but only 1 percent write it. Perhaps you’re the one percent who wants to share your stories or knowledge with the masses. Authorship isn’t the best way to make a living. The reality is that most books don’t sell 5,000 copies, and for many authors it’s way less, especially when self-publishing. However, with a great story, that’s well-written and prepared, and a marketing plan that reaches your target market, writing books can be profitable. You have several choices when selling your books. You can go the traditional route, seeking an agent or pitching publishers directly through a proposal (non-fiction) or synopsis (fiction) and a query. Or you can self-publish your book through many of the free and affordable e- and print book services. A final option is to work with a hybrid publishing company, which offers a little of both. While you pay for hybrid services as a self-publisher, hybrid companies vet authors as traditional publishers do, and give access to their editors, cover designers and marketing experts. Amazon has completely changed the publishing field. Today, with little investment, authors can get their books out to the world without agents and traditional publishers. However, these authors need help in making sure their books are readable. As a result, there is a growing need for editors. To be an editor, you need to have a strong command of language, grammar, and styles of writing that fits the genre of books you want to edit (i.e. Chicago Manual of Style). You can offer basic copy editing, in which you simply correct grammar and punctuation. You can also offer line editing, which also looks at paragraph structure, flow, and word choice. Finally, there’s developmental editing, which refers to evaluating the content. Does the story flow, are the characters well-developed, is the pacing right, etc. The more in-depth your editing service, the more you can charge. But you need to have a good understanding of story development and the craft of writing to offer developmental editing. To get started, create a website or at the very least a LinkedIn profile, outlining your services, and if possible, references and samples of your work. Then start networking with authors to get referrals. If you’re brand new, you might want to offer a free sample edit to help get new clients to try you out. You can also check out freelance writing sites for editing jobs. Most freelance editors earn about $25 per hour, more for more in-depth editing services. Some prefer to charge by the page, anywhere from $4 to $7.50 depending on the type of editing. There was a time when it was fairly easy to make several hundred dollars a week selling used books through services such as Amazon. Now that many used books are sold for a penny, it’s a little bit harder. The exception is specialty books, such as text books. It’s no wonder students struggle financially when a single text book can cost $300 or more. The answer is find the books used or to rent them. If you can get a selection of used text books that professors still require for their students, you can sell them online through places like eBay or BookScouter. If you don’t have the skill or knowledge to do each of these services, you can hire contractors to perform the tasks while you operate as the project manager and CEO. You can charge one-time fees for your services, or you can start a full-fledged publishing company whereby you publish the books under your name, paying your authors’ royalties. If you enjoy reading and would love to help great readers get their work into the world, you might consider becoming a literary agent. 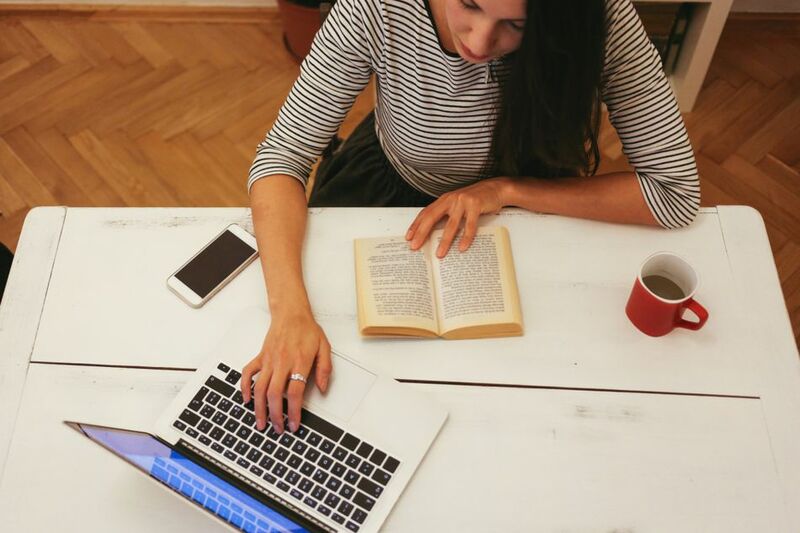 While many literary agents are editors that have left publishing houses, having experience as an editor or in a publishing house isn't required. As a literary agent, your job would be to find great manuscripts, help the author make them even better, and then submit them for consideration to appropriate publishers. If the book sells, you get a percentage of the advance (if there is one) and royalties for as long as the publishing house prints the book. To become a literary agent, you need to have a good eye for what publishers (not necessarily readers) want in a book. Most agents represent specific genres or topics. For example, an agent might take on authors who write mysteries, children's books, or non-fiction business books. It helps to have contacts in the publishing world. If you don't, you can attending literary events and develop relationships with editors on social media. Agents also need to understand book contracts, have good business sense, be organized (to juggle multiple authors, all their queries, and book sales), and have mediation skills to help authors communicate with their editors. The challenge to becoming a successful agent, along with building contacts, is that it can take time to generate an income. Agents don't get paid until authors do. Author's don't get paid until a book is sold to a publisher (if there is an advance, which may or may not happen), and when it sells to the public. Most publishers pay their author's royalties every six months. It could be a year from when you take on an author until a publisher buys the manuscript, and another year to eighteen months before it's published. If there was an advance, it could be a while before the author gets royalties as well.